I stopped golfing because my game really did ruin a good walk. While I was playing, I learned there were many aspects of the game with affinity to life. One was that you have 20 bad shots and are ready to quit, but one good shot keeps you going for 20 more bad ones. Another that perplexed me was the requirement for and use of a handicap. The joke among good golfers is that in a tournament you fear the high handicapper with a hot putter. It speaks to the fact that the handicap is a pure form of socialism. Instead of winning on personal merit and ability, you can win because of a statistical adjustment – an equalization. Canada has a federal process that is similar to the golf handicap system. It is called “equalization payments”. Many consider it sacrosanct and untouchable, but in reality it masks and perpetuates real problems. Formalized in 1957, it initially planned to give residents of each province the same per capita revenue as those in the two wealthiest provinces British Columbia and Ontario using personal, corporate and inheritance taxes. Like all government programs they are never reduced but grow, almost always for political rather than practical reasons. In 1962 they added 50 percent of natural resource income to the mix, and in 1967 they expanded it to include all government revenues, except energy. It is reported that Canada now has the most expansive and generous, redistribution of wealth system, in the world. To guarantee the continuance of the system it was included, by an amendment to the constitution, through the Canada Act 1982. This was the Act that transferred political power to Ottawa from Westminster, and used as an opportunity to entrench such political ideologies. Provinces are designated, ”have” or “have not”, based upon their ability to generate tax revenue. A dramatic turn occurred in 2009-2010 because Ontario, the only “have” province, from the start, became a “have not’ province. Newfoundland and Labrador, a “have not” province from the start, became a “have” province. In 1992, when Ontario was a “have” province, Maurice Strong was appointed Chairman of Ontario Hydro. In that same year he chaired the “Earth Summit” of the United Nations Environment Program (UNEP), in Rio, a conference he promulgated and organized. At that conference, the concepts of global warming, as a threat to the planet, were formalized. Through the World Meteorological Organization (WMO) they formed the Intergovernmental Panel on Climate Change (IPCC). The objective was to produce the science that human CO2 was causing global warming. It began with the direction to use the definition of climate change approved by the United Nations Framework Convention on Climate Change (UNFCCC). a change of climate which is attributed directly or indirectly to human activity that alters the composition of the global atmosphere and which is in addition to natural climate variability observed over considerable time periods. This makes the human impact the primary purpose of the research. The problem is you cannot determine human contribution unless you know the amount and cause of natural climate change. The IPCC has failed. We know that, because science is tested by its ability to predict and every prediction they have made was wrong. But before that was even established, Maurice Strong applied the green energy policies, they claimed were necessary, to offset global warming to the Province Ontario. It was supposedly designed to reduce production of CO2, but cancelled nuclear power plant construction. It built windmills that are very inefficient and kill birds and bats by the millions, but do not reduce CO2 production. Wind does not blow all the time or even steadily, therefore power production is intermittent. This means fossil fuel power plants must be kept running all the time, since the pick up must be immediate and seamless, so there is no drop in power. Most systems restrict wind power input to 12 percent because, if the wind stops blowing, anything more causes an overload. Ontario became the testing ground for Strong’s green energy policy and the people are paying a very high price. Worse, it is completely unnecessary, because the justification for adopting the policy that human CO2 was causing global warming, is wrong. For the last 19 years, global temperature has leveled and declined while CO2 levels continue to increase. Further proof of the failure of the green agenda and energy policies is they are failing in every country where they were adopted. Germany is a good example as a March 14, 2013 Forbes article notes. There’s nothing wrong with expanding renewable energy sources. The more choices available in this (or any) marketplace the better consumers will be served – both from a price and a quality standpoint. However serious problems are caused when government starts using taxpayer resources to subsidize or incentivize these expansions. Things get even worse when centralized planners start manipulating market choices or trying to manage the marketplace itself by controlling the generation of power. The article title is “Germany’s Green Energy Disaster: A Cautionary Tale For World Leaders”. Change Germany to Ontario and the world leaders would have known, back in 2003, when Dalton McGuinty was elected. The after effects of Strong’s policies kept accumulating, so a 2010 Toronto Sun headline warned, “Expect a 46% hydro rate.” Strong’s policies were continued and exacerbated because of the political input of David Suzuki in McGuinty’s re-election; actions that forced Suzuki to resign from his Foundation. The Ontario government of Premier Kathleen Wynne, continues the destructive policies instead of recognizing the root cause. The reason is because the real economic and social costs of the damaging energy policies are masked by Federal Transfer payments. In 2009 – 2010 Ontario received $347 million in transfer payments, while Newfoundland received nothing. Table 1 shows the total transfer payments to Ontario including equalization. Transfers allow Ontario leaders to avoid facing reality. Worse, it allows them to pursue even more damaging policies. For example, McGuinty and Wynne have both pushed fracking aside, even though the claims of damage are proved wrong. They refuse to allow development of nuclear power, which is already proved as a reliable safe source, in Ontario, and with advances in technology can be cheaper and more efficient. 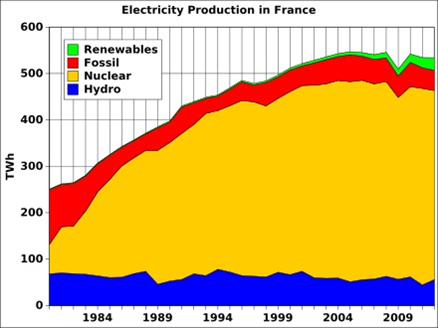 Look at the success story and safety record in France, where nuclear has dominated power production since 1984. Ironically, France, under the socialist government of Francois Hollande, was elected in 2012 proposing a one-third reduction of nuclear power by 2025. Wynne is planning to add insult to injury with a proposed “carbon tax”. Why do people keep voting for those who promise programs that are proven failures? The answer is partly provided by a 19th century quote. George Bernard Shaw summarized the reality in stark terms. “A government with the policy to rob Peter to pay Paul can be assured of the support of Paul.” The Canadian equalization scheme aids and abets this by protecting governments from accountability for their failed policies. What makes it worse, is the policy was chosen to reduce CO2 emissions, adopted blindly by ideologues who did not look at or understand the science.